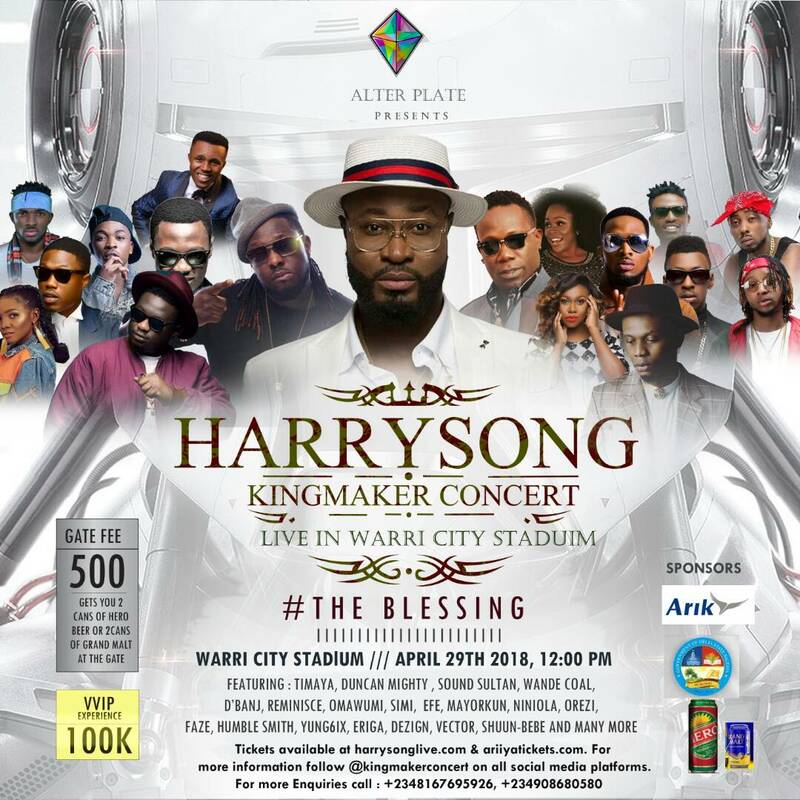 Multi-award winning Nigerian musician, Harrison Tare Okiri popularly known as Harrysong will make history on Sunday, April 29th night when he fills up the Warri City Stadium to a capacity of 40,000 people. This will be the first time a concert of this magnitude is happening in the Niger Delta region, and according to him, it promises to be hours of high octane entertainment for his fans in Warri and across the world who would tune in via the live broadcast. Harrysong has asserted himself as a trailblazer across the Nigerian and African music scene, he commands a great influence in the African pop and contemporary music space as he continues to dominate with his exceptional talent and creates a massive following on a worldwide scale. In giving back to his numerous fans, Harrysong has put together the Kingmaker concert dubbed ‘The Concert Of The Year’ by music pundits. Riding on the phenomenally successful and record breaking One Delta concert, multiple award-winning and top selling recording artiste, Harrysong is set to re-write history yet again, The ‘Kingmaker concert’ is an annual empowerment and fan appreciation concert, set to hold this April 29th, 2018. This year’s concert is put together by AlterPlate and promises to be a weekend with a bee-hive of events. In the line-up, there will be performances from chart-topping artistes like D’Banj, Wande Coal, Duncan Mighty, as Harrysong goes back to his neighbourhood where the dream all began. A few lucky fans will be given the cool opportunity to a all expense paid trip via the ‘My Beautiful Delta State’ campaign inclusive of the series of empowerment program that would lead as build up to the final event. The event would be streamed live to millions of viewers via popular urban music channel HipTV and on social media. Harrysong’s audacity to dream big and take the first steps himself to making his dreams a reality, will forever be written in the history books of Nigeria and Africa as a continent. Date: Sunday, April 29th, 2018. Venue: Warri City Stadium, Delta State. As the countdown begins and excitement heightens, be sure to make it a date. Visit www.harrysonglive.com or follow social media platforms @kingmakerconcert on Instagram, Facebook and Twitter for updates on artiste line-up, ticket purchase and other exciting info.